2nd Birthday Wishes: Second birthdays are all about drooling over the tiny toes, chubby cheeks, funny faces and the innocent eyes. 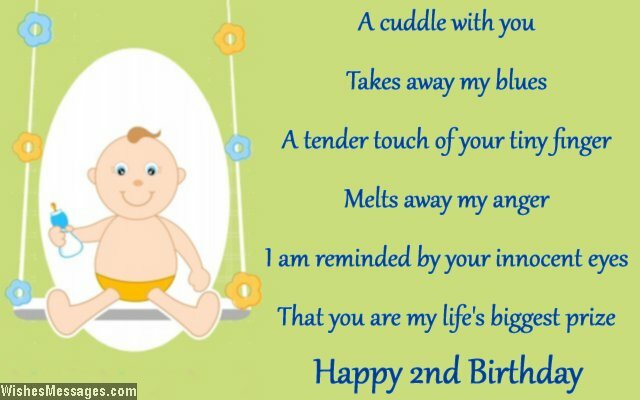 This post is a heart-melting mix of the cutest, sweetest and most adorable Happy Birthday messages for two year olds. Read them and take ideas to write your own personalized quotes on a greeting card. Whether the cutie pie is your own baby boy, baby girl, grandson, granddaughter, niece, nephew or one of your friends’ little bundle of joy – make sure that your card goes on to become a beautiful keepsake that can be cherished decades down the line. 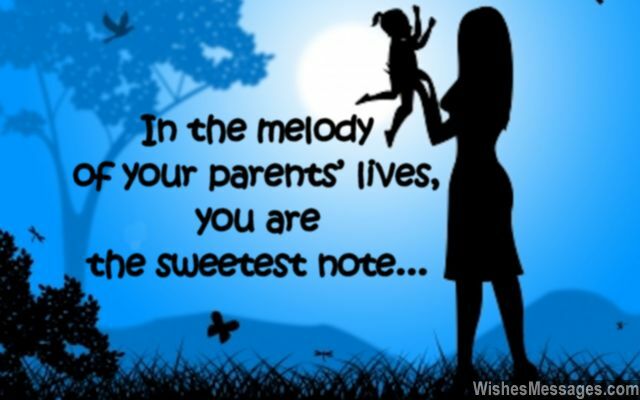 1) In the melody of your parents’ lives, you are the sweetest note. Happy 2nd birthday. 2) Picking you up and cuddling you in my arms, looking into your eyes and being smitten by your cute charms. I wish I could hit the pause button in my life’s journey, so I could enjoy these beautiful moments in your company. Happy 2nd birthday. 3) You may be just 24 months old, but you have given us the happiness of a lifetime. Happy 2nd birthday. 4) You are like a warm blanket. Whenever I take you in my arms, I feel warm and cuddly. Happy 2nd birthday. 5) You are the cutest, you are so adorable. You are the sweetest, you are so lovable. Without your heart-warming cuddles, the world seems miserable. Happy 2nd birthday. 6) Whether you turn two or twenty two, all you need to remember is that I Love You. Happy 2nd birthday. 7) Whenever I hold your tiny feet, my heart skips a beat. Whenever I hold your little hand in mine, it reminds me that life is so fine. Whenever I tug your chubby cheeks, it gives me all the happiness I seek. Happy 2nd birthday. 8) Mom’s little reflection, dad’s little angel, grandpa’s little friend, grandma’s little bundle. Happy 2nd birthday, little one. 9) You have graduated from using a nappy to sitting on the potty. I wish you many such big achievements in life. Happy birthday. 10) Happy birthday to the cuddly two year old hunk who is already winning everyone’s hearts with his cute charms. 11) I don’t know if I will be able to do what it takes to achieve all my dreams. But I do know that I will do whatever it takes to help you achieve all your dreams as you grow up into a fine young lad. Happy 2nd birthday son. 12) May the rest of your life be exactly like your second birthday – full of treats, goodies and the love of your family. 13) I look into your eyes, and I see the true meaning of innocence. I feel your little heart beat, and I understand the true meaning of love. Happy 2nd birthday. 14) In the last twelve months since your 1st birthday, your experience and age has doubled… and so has your cuteness. Happy birthday little one. 15) Congratulations for turning old enough to eat your birthday cake all by yourself. Happy birthday. 16) You are the naughtiest two year old anyone has ever seen. But all is forgiven because you are also the cutest there has ever been. Happy birthday. 17) Your cute little footsteps have carved out a path that goes straight into the alleys of our heart. Happy 2nd birthday. 18) This is the time to use your cuteness to get anything you want from your parents. Happy 2nd birthday. 19) You may be a tiny little bundle of joy… but the happiness you spread around is king size. Happy 2nd birthday. 20) I don’t mind if you lose your baby fat and chubby cheeks, but don’t ever lose your innocence. Happy 2nd birthday. 21) Turning two must have been difficult – a cute toddler like you must have endured so many hugs and kisses to reach here. Happy 2nd birthday. 22) Happy 2nd birthday to the little girl who is destined to do big things in her life. 23) The only person in the world who has made us smile for two continuous years is you, my baby. Happy 2nd birthday. 24) My life has been full of ups and downs… until the day you were born after which it has only been going up. Happy 2nd birthday to my baby. 25) Whether you turn two or twenty two, you will never stop being my cuddly-coo. Happy birthday 2nd birthday. 26) Congratulations on scoring your second goal in life. You have many more to go. Happy birthday. 27) The only reason I love my world being all blue, is because I have super cute baby boy like you. Happy 2nd birthday. 28) You have turned my heart into a marshmallow which melts by the warmth in your lovely round eyes. Happy 2nd birthday. 29) Although you can barely walk, you have conquered all our hearts. Happy 2nd birthday. 30) The last twenty four months have made me realize the true purpose of my life – to be a responsible and loving dad to a beautiful angel like you. Happy 2nd birthday sweetie. 31) A cuddle with you, takes away my blues. A tender touch of your tiny finger, melts away my anger. I am reminded by your innocent eyes, that you are my life’s biggest prize. Happy 2nd birthday. 32) People spend years learning how to spread happiness and joy. You are a master at it already. Happy 2nd birthday. 33) Congratulations, you have successfully harassed your parents for one more year. Happy 2nd birthday. 34) You are so tiny but the smiles you bring on everyone’s faces are huge. Happy second birthday darling. 35) You are already a celebrity in the family because everyone wants to take pictures with you. Happy 2nd birthday. 36) Congratulations for turning two. You are two years closer to becoming a tall and handsome man. Happy birthday. 37) My world is an oyster and you… are its radiant pearl. Happy 2nd birthday. 38) Your feet are deceptively small, because your footprints on your heart are huge. Happy 2nd birthday. 39) There’s time until you become the prince of a girl’s dreams. Till then, enjoy being the king of our hearts. Happy 2nd birthday son. 40) If only… your cuteness could be stored away in a jar. Happy 2nd birthday to my baby.